For the longest time Amazon's Kindle Unlimited has had one unique advantage over its competition: it was the only streaming(*) ebook service that worked on an ereader with an E-ink screen. That changed this week. The Dutch ereader maker Icarus has released a new version of its Illumina ereader. The Illumina line run Android, and now there is a model that ships with the Skoobe Android app integrated into the firmware. The Illumina Skoobe edition has a Carta E-ink screen, frontlight, and touchscreen. It costs 120 euros (the same as other Illumina models) and comes with 512MB RAM 8GB internal storage, a microSD card slot, and Wifi. Thanks to the fact that the Illumina runs Android 4.2 on a dual-core CPU, it was not too difficult for Icarus (or more likely their hardware partner, Boyue) to integrate the Skoobe app. 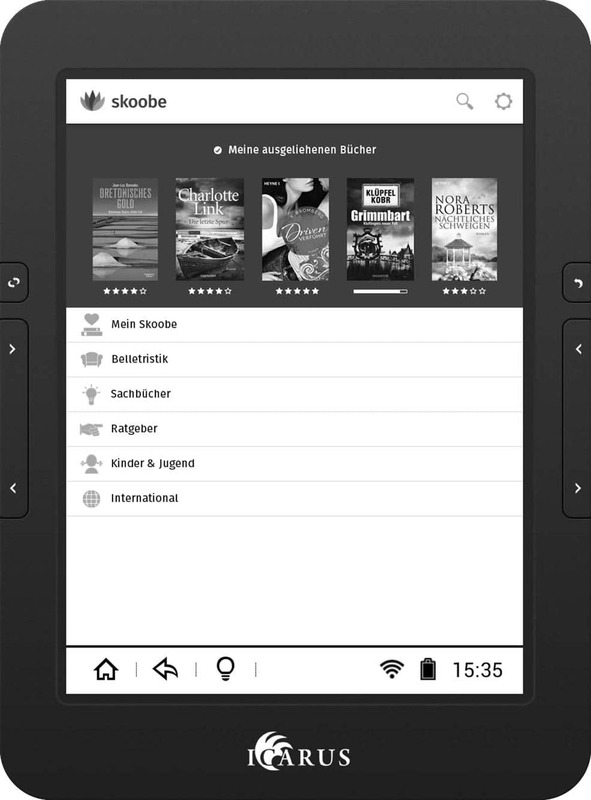 That app offers access to a catalog of 120,000 mainly German language titles at a cost of $10 euros per month (and up). And this, folks is why I like Android on ereaders (even though it has battery issues). The new Illumina is not the first ereader to run a subscription ebook app; I have installed apps like Oyster and Scribd on the Android ereaders that I've reviewed, starting with the Onyx Boox T68, last June). But this is the first device (other than the Kindle) to ship with a streaming ebook service integrated into its firmware. Skoobe is owned by Bertelsmann and Hotlzbrink. One owns about half of Penguin Random house, while the other owns Macmillan. According to the website, the Skoobe service is only available in Germany, Austria, and Spain. In Germany, Skoobe competes with Kindle Unlimited, which costs 10 euros per month, offers a catalog of 850,000 titles, and works on the Kindle. Other competitors include 24Symbols, Scribd, and Readfy. All offer an Android app, but none directly support ereaders in general or Android ereaders in particular. P.S. I am now referring to services like Skoobe and Kindle Unlimited as streaming ebook services, not subscription services. Coverage of recent ebook news, including the closure of Entitle, has convinced me that we need to be more specific in discussing details like Entitle being a retailer and Skoobe being a streaming service. Too many people were misinterpreting the impact the one had on the other because both were called subscription services. I think referring to subscription services as streaming services is just going to confuse things more. Streaming means something else entirely. “Subscription” accurately describes these services. Subscribers download. No streaming is involved. Subscription is the payment process, not the business model. We need a word that defines the model so that people can tell the difference between the way Audible and Scribd work (example). If you want to propose another term, like access-based, that would be fine. But we need to stop using the word subscription to talk about services like Scribd, Netflix, and Spotify so that it is clear that they work differently from your newspaper subscription.